Pam Silver's lab has developed Assembly standard 23, often called the Silver standard, for assembling protein domains. It relies on shortening the BioBrick prefix and suffix each by 1 base pair such that the resulting SpeI-XbaI scar is only 6 base pairs long and protein domains can be assembled in frame. As shown in figure 3 (right), Assembly standard 23 results in the inclusion of a Thr-Arg (ACT AGA) two amino acid junction between protein domains. One disadvantage of the Assembly standard 23 is that the codon AGA which encodes Arginine is a rare codon in E. coli. Rare codons can prevent over-expression of proteins in E. coli. See The BioBricks Foundation wiki for a discussion and comparison of different technical standards. Or get help on Assembly standard 23 parts. Caroline Ajo-Franklin developed the Silver lab protein fusion vectors BBa_J63009 and BBa_J63010 in Pam Silver's lab. Protein domains encode portions of proteins and can be assembled together to form translational units, a genetic part spanning from translational initiation (the RBS) to translational termination (the stop codon). There are several different types of protein domains. Unfortunately, the original BioBrick assembly standard, Assembly standard 10, does not support in-frame assembly of protein domains. (Assembly standard 10 creates an 8 bp scar between adjacent parts.) Therefore, it is recommended that you use an alternate approach to assemble protein domains together to make a translational unit. There are several possible approaches to assembling protein domains including direct synthesis (preferred because it creates no scars) as well as various assembly standards. 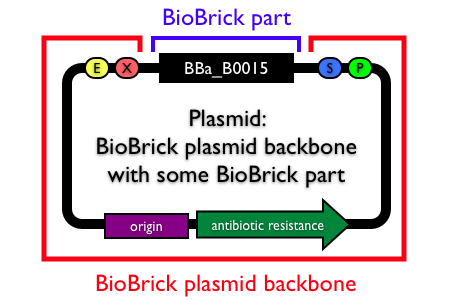 Regardless of which standard you choose, we suggest that the resulting protein coding sequence or translational unit comply with the original BioBrick assembly standard so that your parts can be assembled with most of the parts in the Registry. Note: Although most RBSs are currently specified as separate parts in the Registry, we are now moving to a new design in which the RBS and Head domain are combined into a single part termed a Translational start. The new design has the advantage of encapsulating both ribosome binding and translational initiation within a single part. Our working hypothesis is that the new design will reduce the likelihood of unexpected functional composition problems between the RBS and coding sequence.